Books for Africa from Kristin Cornelius on Vimeo. 4Humanities@CSUN is pleased to introduce graduate student Naomi Carrington in its second MiniDoc presentation. In this short video, Carrington’s passion for literacy, diversity, and charity are exhibited as she discusses her project Books for Africa. Part of the charitable offerings of the organization Better World Books, this project allows a participant to send books to an underprivileged place of their choosing completely free of cost. Carrington describes how a trip to Africa in 2009 provided the impetus for her desire to dedicate some of her time and effort while in graduate school to their cause. 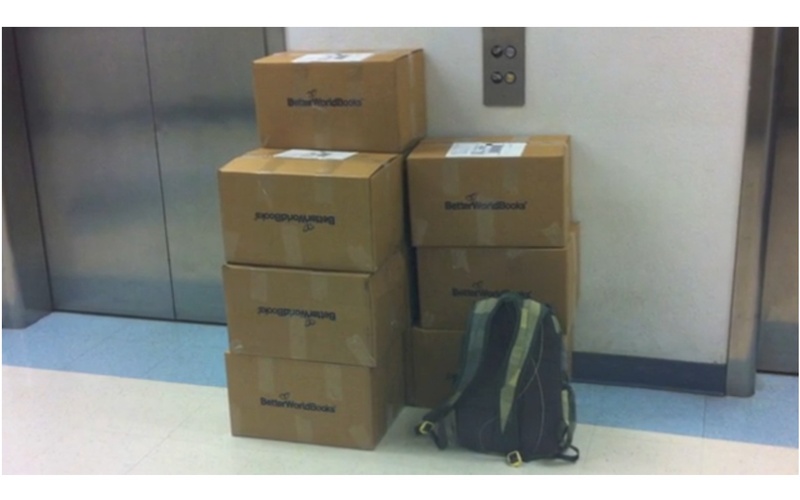 Thus, in fall 2012, she reached out to Better World Books and asked for the materials to gather and send books to Africa. Her project ultimately brought in over four hundred pounds of books that were shipped overseas in December. From a similar motivation stems Carrington’s study in multicultural literacy. As a Teaching Associate at CSUN during the Rhetoric and Composition program, she has taught several first-year composition courses. Throughout this experience, she’s encountered a multitude of students from diverse backgrounds; these students’ experiences, she’s noticed, often lead to varying levels of competency in Standard English. Moreover, she recognized a need to create a space in the classroom for these students’ variations of English and the issues they face because of these differences. Carrington has already scheduled another Books for Africa event to take place at CSUN mid-April, and hopes for these events to continue once she’s graduated. Read more at CSUN’s Center for the Digital Humanities. Naomi Carrington is a graduate student at California State University, Northridge where she is studying English Rhetoric and Composition and will graduate in May 2013. She teaches first-year Composition courses and is also a writing consultant in the university’s Writing Center. She is currently the treasurer of 4Humanities@CSUN. She is particularly interested in literacy and the linguistic relationships between English composition and the societies in which they exist, and wants her students to observe the differences between English vernaculars and dialects by being more aware of their own voices and writing styles. She hopes to pave the road towards a more encompassing, culturally rich education—one that would be more sensitive to racial, cultural, and ethnic differences.